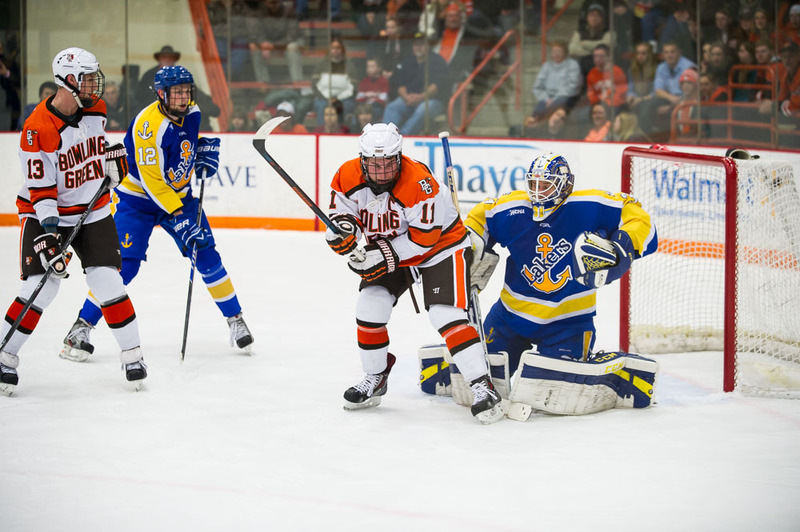 Bowling Green quickly redeemed itself Saturday night in the Ice Arena. The Falcons — just one night after a poor performance — rebounded to play well en route to a 3-1 victory over Lake Superior. BG dominated the first period, building a 2-0 lead, and extending the margin to three goals early in the second period. The Falcons then held Lake Superior off the rest of the way to earn a split of the series. The Falcons weren’t sharp offensively, defensively or in goal during the first game of the series Friday in a 3-1 loss. The Falcons, ranked sixth nationally, improved to 15-5-4 overall and 11-3-2 in the Western Collegiate Hockey Association. Lake Superior is 7-20-1, 6-14. The Lakers, who had a three-game winning streak snapped, have been much improved since a difficult start. They’re 4-3-1 in their last eight games. “It wasn’t a lot of work, but it took some conversations as a team, ‘we’re much better than this and this isn’t the effort we’re capable of bringing,’” Burke said of how BG bounced back. The Falcons finished with a 41-27 edge in shots on goal, including an 18-7 margin in the first period. In the first period alone, BG attempted 37 total shots — compared to the 31 shots on goal it had Friday. Bergeron said the team’s goal for Saturday was to play at a higher level and to play with more intensity and effort — not to make amends for Friday’s loss. “I want them to take advantage of playing a game and that’s what today was,” Bergeron said. REBOUND: The Falcons are 8-1 this season in games after a loss or a tie, including wins over top-ranked Minnesota State, No. 9 Miami and No. 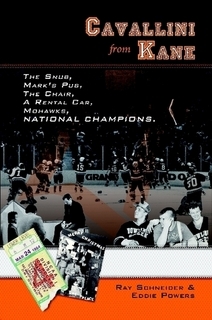 10 Michigan Tech. DEPTH: The Falcons made three lineup changes — inserting freshmen forwards Ben Greiner and Brett D’Andrea, and junior defenseman Jose Delgadillo. They replaced forwards Jakob Reichert and Pierre-Luc Mercier, and defenseman Mike Sullivan. Reichert is a freshman, Mercier is a sophomore and Sullivan is a senior. The lineup changes were a reflection of the increased talent and depth BG has in its program. “Our program is at a place where if you don’t live up to the expectations you’ve set for yourself, there’s accountability,” said Bergeron, who is in his fifth season. Greiner and D’Andrea joined junior Brent Tate on a line that scored BG’s third goal and combined for nine shots on goal. Delgadillo was solid on the blueline. Sullivan and Mercier were healthy scratches for the first time this season. Greiner played for just the sixth time, but has impressed the coaching staff with his play in practice. Mercier has four goals and 12 assists this season, and plays on the penalty-killing unit. Sullivan has been a regular on defense throughout his career. Reichert has two goals and three assists in 22 games. GOALS: The Falcons built their 2-0 lead on goals from Adam Berkle at 10:46 and Ben Murphy at 18:44. Berkle’s shot from in front trickled past goalie Gordon Diefel. Murphy scored with a hard shot on the power play from the right circle, going high to the glove side over Diefel’s left shoulder with a partial screen. BG made it 3-0 when D’Andrea was between the circles to tip in Mark Friedman’s shot from the right point as he broke into the Laker zone. Tate made a nice play to set up the rush. BURKE: Although the Falcons held the edge in play most of the night, Burke still had to be sharp. The Lakers peppered Burke late in the second period, but the junior responded to keep BG’s lead at 3-0. Burke probably had 10 of his second-period saves in the last 10 minutes of the period. One of the stops was a blocker save off a 2-on-1 rush and he stacked his pads to the left to make the other save. “Those are the saves goalies need to make. It wasn’t overwhelming, but they were pushing pretty hard,” said Burke, who has a 2.19 goals-against average and a .924 save percentage in 11 games. Burke also made a nice glove save on Garret Clemment in the first period with BG holding a 1-0 lead. Clemment’s chance came on a near breakaway. Burke was coming off a 38-save performance last Saturday in a 3-2 victory at No. 10 Michigan Tech, his first start since Dec. 6. The only Laker goal came after BG failed to clear the puck out of its defensive zone at least twice and they eventually left Burke to fend for himself. Stephen Perfetto scored from the right side of the crease with 6:54 to go in the second period to cut BG’s lead to 3-1. “Tommy played well, He allowed only one goal, got the win — that’s good stuff,” Bergeron said. IRONY: Tate, who entered the game with 34 penalties for 98 minutes in his career, played the role of peacemaker during the first period. Tate was drilled into the boards from behind by the Lakers’ Luke Sandler with 4:08 to play in the first period. Greiner confronted Sandler when play was later stopped, but Tate quickly got up and pulled Greiner away — allowing the Falcons to enjoy a 5-minute power play. In the past, Tate may have gotten up and retaliated against Sandler. And in junior hockey, where fighting is allowed, Tate may have fought Sandler after the hit. Tate has just five penalties for 18 minutes in 16 games this season. The 6-foot-2, 187-pound Tate brings a physical presence and is one of BG’s best competitors. Sandler received a major and a game misconduct for checking from behind. He also received a double minor earlier in the period, one for boarding and one for roughing after hitting BG’s Connor Kucera behind the BG net. PK: BG’s penalty-killing was 5 of 5 in the game and 8 of 8 in the series. The Falcons had to kill three penalties in a 10-minute of the third period Saturday. They also fought off two 5 on 3s of 18 and 22 seconds in the game. BG’s penalty-killing is aggressive, forcing opponents into mistakes in all three zones. The Lakers had more time in the offensive zone Saturday than they did Friday, but BG was able to clear the puck, block shots and Burke made seven saves against the Lake Superior power play. “We’re on the same page,” Bergeron said. “We’ve been aggressive and anticipating where each other is going to be. It’s a cohesive group. That’s the way we want to kill. “We want to be aggressive, but the only way you can be aggressive is if you’re all on the same page and playing together or else it looks choppy and that aggressiveness can work against you. The BG penalty-killing ranks first nationally at 93.8 percent. The Falcons haven’t allowed a power-play goal in three straight games and in eight of the last nine games, going 35 of 36 in that span. PP: The BG power play was 2 of 9 in the series, including a 1 of 4 effort Saturday. BG has scored a power-play goal in four of its last five games, going 4 of 21 in that span. Before the recent improvement, the Falcons were just 5 of 49 in a 13-game span. PAIRWISE: The Falcons are sixth in the Pairwise Rankings after this weekend’s action. The rankings mimic the criteria used to select the teams for the NCAA playoffs. The Falcons would be a No. 2 seed, if the NCAAs started this week. NEXT: The Falcons travel to Bemidji State next weekend for a two-game league series. Bemidji beat two ranked teams this weekend to win the North Star College Cup in St. Paul (Minn.). They posted a 4-0 win over No. 7 Minnesota-Duluth Friday and a 3-1 win over Minnesota State Saturday. Bemidji is 9-12-3, 5-8-3, including 3-1, 3-2 losses at BG Nov. 21-22. Faceoff is 8:37 p.m. Friday and 8:07 Saturday.